Recently, whilst messing with sprites and the Grrr framework, I got thinking about better graphics for games. As PowerShell is very slow at doing console atomic write operations, a game should really have fewer, larger sprites. I then thought about ASCII art, and wouldn’t it be great if PowerShell could convert existing images (jpg, png) and produce lines of text for use with Grrr’s create-image function. So my morning’s work is a PowerShell script that does just that. Unfortunately, it’s only monochrome. I had a lot of trouble getting a reasonable conversion of RGB or HSV to the console’s limited colour palette and character range, so in the end, I removed it. The script uses System.Drawing and demonstrates one (a good?) way of adding an assembly to PowerShell. hmmm… I get an div by 0 error. The $imgwidth, forced gives nothing more. What type of image is supported? I tried a jpg one. @ymasur – i’ve used some png and jpg images. 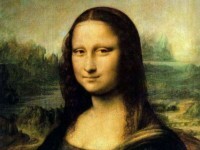 the image linked to the monalisa thumbnail for one. what image(s) are you using? I get this if you don’t put the explicit path to the input file. i.e. Oh yes, so do I.
I’ll figure it out and repost the script. I fixed it and updated the post to point to the new script.